"You haven't been???" remarked Vandelay as he was suggesting lunch spots in Downtown. I admit it. It's true. I have been so busy lately! Although there has been plenty of literature about Mamak Cafe, I either chose to ignore it or I just didn't remember. Hence, it was right in front of my face while I was next door at Meat & Bread and I still didn't clue in. Well, to be fair, it is not exactly an easy place to spot. You see, it is inside Pub 340. And to top it off, other than a few small pieces of letter-sized paper stuck to the window, no one would even guess there was Malaysian food to be found. In fact, Pomegranate joked that he was there with his buddies and didn't even notice the place. 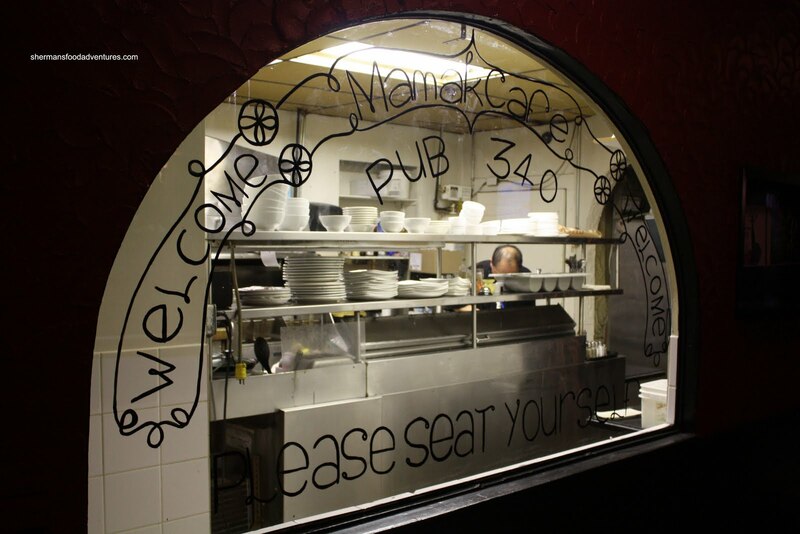 Once inside the pub, there is a small designated area at the entrance specifically for Mamak. Mind you, there is the option to sit in the pub itself and be served the same food. Depends on your fancy. For me, I chose option one since the last thing I need are inebriated individuals questioning my picture-taking. 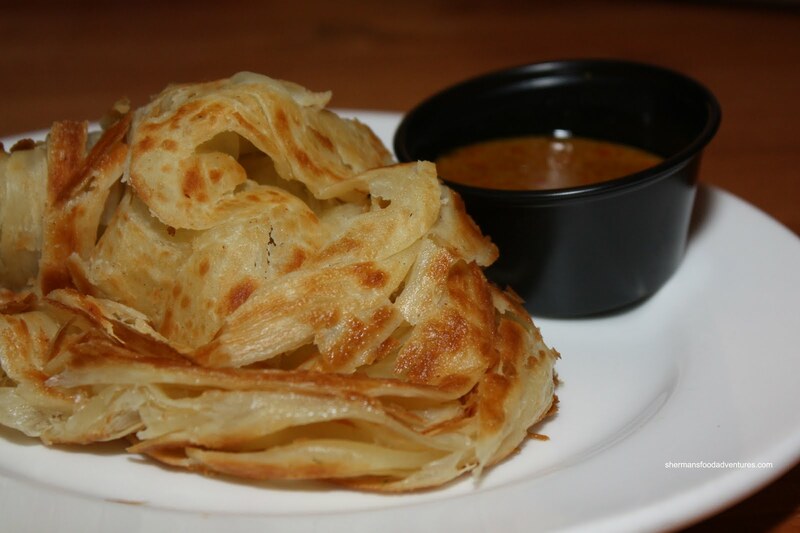 We decided to order some items to share starting with the Roti Canai. I have to say that this is one of the best versions I've tried in Vancouver. Flaky, chewy and crispy without being oily, the roti was further amped by the outstanding sweet curry dip. I liked the thickness of the dip as well since it easily adhered to the roti. 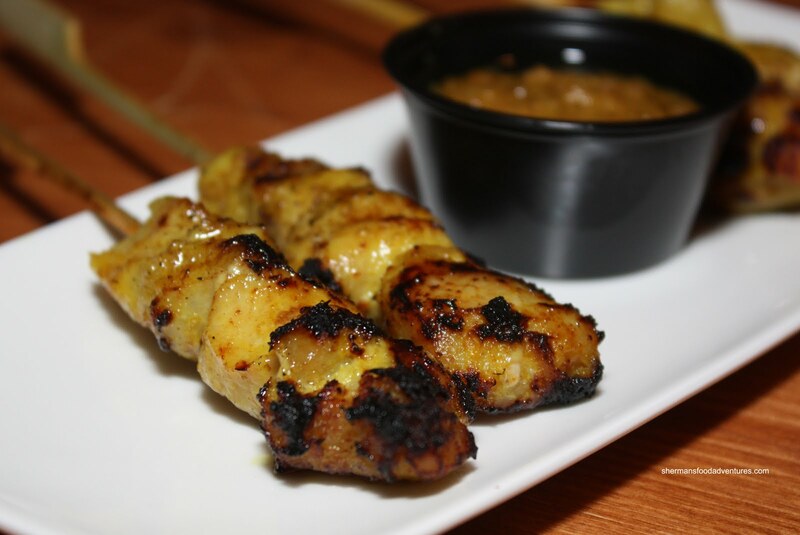 We also got an order of the Chicken Satay to share. Nicely charred while not completely overcooked, the chicken benefited from the tasty peanut dip. The dip was a good combination of nutty and sweetness. 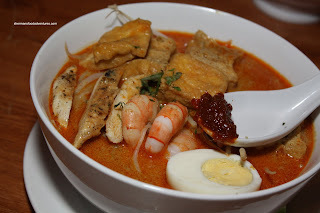 The first of our main was the Laksa. As you may know, there are not many places to get a good laksa in town, with probably one of the most popular being Bo Laksa. For me, it was good; but it didn't wow me. The one here didn't wow me either; but it came close. The fragrant coconut broth was darn tasty. It was probably a little heavy on the coconut milk; but personally I like that. Combined with perfectly cooked noodles and ingredients, I enjoyed it very much. Next up was another Malay classic in the Nasi Goreng. Presented a bit differently than I am used to, it was missing the fried egg, shrimp chips and fried chicken. The frozen veggies were a bit odd for me as well. Ultimately, it did taste okay with only a moderate amount of spice. I did like the perfectly cooked shrimp. 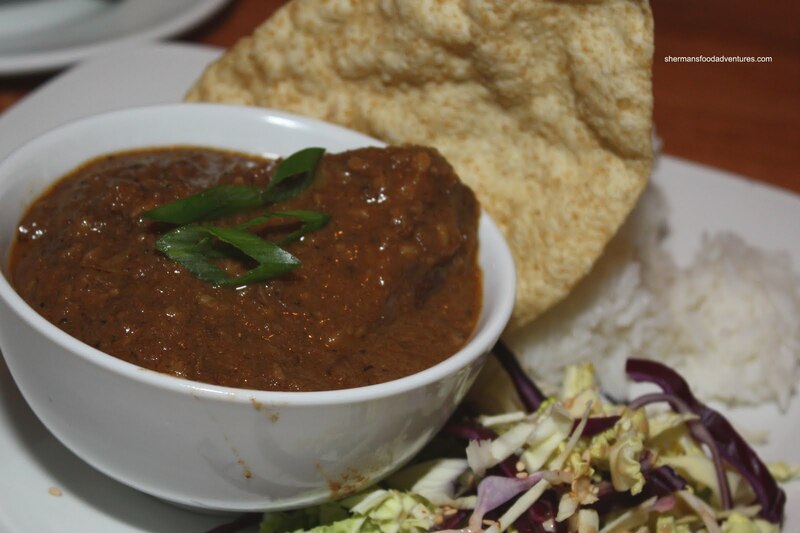 Lastly, we had the Beef Rendang. It was also very coconutty and easy on the spice. Sure, this dish is not supposed to be that spicy; but for me, it was a bit too mild. Despite this, there was still hints of the many spices that make up this dish. The big chunks of meat were both good and bad. Good, because there was lots of beef. Bad, it was a bit hard to eat. I guess it's a catch-22. Too small and it might turn out really dry. 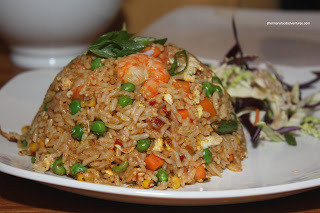 Whatever the case, this was still a good dish and went well with the perfectly cooked rice. As we were finishing up, there was a certain level of satisfaction at not only the food; but at the final cost. The food is reasonably-priced here for the quality and level of execution. Sure, it's got this odd-location, ethnic-food-thing going on which makes it unique. But if we look past that and focus solely on the food. It is pretty good and that is all that matters. Nice review! I would've never find out about Mamak on my own. Tried their Beef Rendang and Roti today, they're tasty and authentic. The chef was super friendly. FreshBowl is opening up next to Mamak, I wonder if people will go to Mamak since FreshBowl will probably have a more comfortable space? 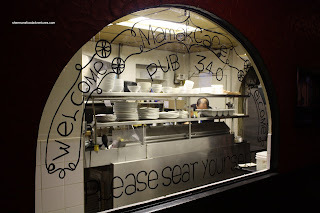 Hopefully Mamak will stay in Gastown for good. Thanks Becky! I think these hidden gems are always a nice find. Especially when they have good food! becky, maybe i will get food from Mamak and eat it at Fresh Bowl haha.